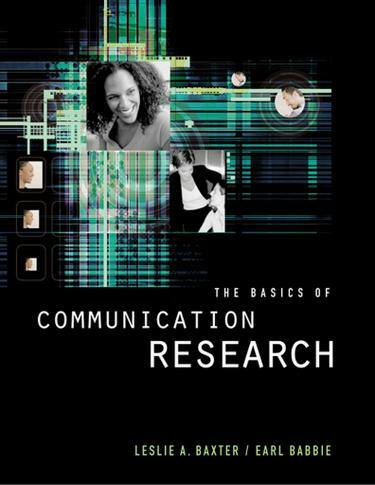 Baxter, Leslie A.; Babbie, Earl R.
Combining the time tested classical work of Earl Babbie with the insights of one of the most recognized and respected names in speech communication research, THE BASICS OF COMMUNICATION RESEARCH is the book for the Communication research methods course. With the authors' collective experience teaching research methods and as active researchers themselves you will find this text to be the authoritative text for your course. The authors frame research as a way of knowing, and provide balanced treatment to both quantitative and qualitative research traditions in communication research and present it in a student friendly and engaging format. It provides in-depth treatment of the role of reasoning in the research enterprise and how this reasoning process plays itself out in planning and writing a research proposal and report.